The Perfect Balance is a pedal of rare beauty, though at a price. It's also perfectly named. It's not just a clever name. Superb build quality. Sonor's Perfect Balance pedal marks the culmination of a personal project that has occupied brilliant Swiss drummer Jojo Mayer for over half a decade. After realising that he only felt comfortable playing vintage pedals Jojo began constructing his own pedal, going through many prototypes before reaching the design that has gone into production. He researched the market thoroughly, concluding that modern pedals provide plenty of power but are inherently unbalanced. "Jojo's design aspires to incorporate the balance qualities of pedals from earlier eras into a modern chassis"
Jojo's design aspires to incorporate some of the calibration and balance qualities of pedals from earlier eras into a modern chassis. The results are absolutely beautiful; the pedal is a vision of minimalist elegance, so much so that we're in two minds whether to play it or mount it on a plinth. The single post, chrome-plated footboard, round cam, strap drive and classic felt beater are all present for solid functional reasons, but boy, do they look good with it. Rather than offer endless adjustments, Jojo's pedal allows you to tweak a few key areas to your personal preference. This is refreshing as, ironically, too much choice isn't always a good thing. Initially the action feels a little light compared with our own pedal, which hurls the beater into the head with more gusto. "The pedal is fast and fluid yet always poised and able to respond to the subtlest of touches"
However, after a few minutes our technique begins to acclimatise to the Perfect Balance. The clue is definitely in the name, as each stroke feels absolutely equal to the following return. Prolonged playing finds us becoming even more acquainted with the pedal, to the point of finding it almost effortless - fast and fluid yet always poised and able to respond to the subtlest of touches. The fibre strap doesn't lag, flutter or impede the action and is silent in execution. When folding the pedal down for packing (which it does in one ingeniously smooth movement) the strap doesn't scratch the footboard in the same way a chain would. 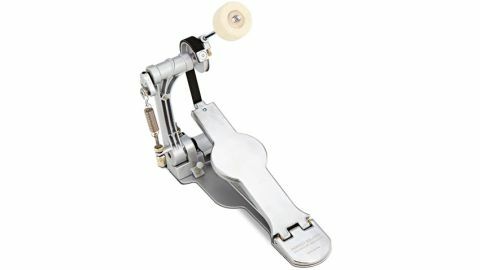 Reversing the folding action to set the pedal up tightens the clamp straight onto the bass drum hoop without the need for further adjustment. Perhaps unsurprisingly, there are no plans to produce a double model. To Jojo Mayer's credentials of world class player, educator and all-round advocate of percussive enlightenment, pedal designer of repute can now be added.